Demonstrate compliance to standards such as IEC 62304, FDA 21 CFR Part 820 and Part 11 or ISO 14971 is usually a time consuming task and many times involves manual activities which are error prone. Software is exponentially growing in complexity and criticality. Time to market takes companies to develop in parallel and implement branches which will afterwards be merged. Deal with complex product lines to target different market segments is difficult and time consuming. Perform your hazard analysis and risk assessment. Automated creating of documentation used for Audits. 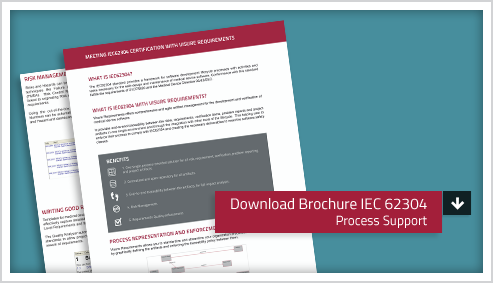 Streamline the requirements process in order to achieve compliance with standards such as IEC 62304, FDA 21 CFR Part 820 and Part 11, ISO 14971and regulations in a cost effective way. Manage the traceability between your System and Software requirements, risks, risks control measures and mitigation, tests and any design artifacts. Generate full traceability reports. In one click, generate reports and dashboards of the traceability, requirements coverage, test status, risk analysis and any artifacts needed for audits. Define and follow risk management and mitigation process, using techniques such as FMEA. Identify and document problems and track their resolution.